The kickoff in football is one of the most exciting plays in a game because it marks the start of the game or transfer of possession after a score. Several basic rules are dedicated to organizing and regulating kickoffs, but every level and organization might have a variation in the rules. For example, high school football enforces kickoff rules based on the field layout and ability level of the players. Along with the general outline and markings on the field, an X is painted on the middle of each 40-yard line to indicate the location of the tee position for the kicking team. However, the kicker can move the tee to another location on the same line if he chooses. 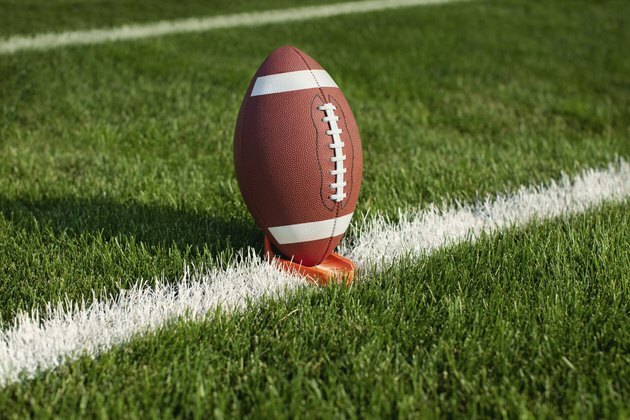 The kickoff marks the beginning of each half of the game along with the transfer of possession after a touchdown or field goal. Each team has to have 11 players on the playing field during the kickoff. The kicking team is allowed to line up on its own end of the field behind the 40-yard line. The layout and positioning of the players can change as long as every player is behind the 40-yard line. As the kicker approaches the ball, he must kick the ball before any of the other players cross the 40-yard line. Once the ball is in the air, the kicking team players can use their hands to ward off any opponents from the receiving team who are attempting blocks. The receiving team can line up in any pattern with the closest players to the kicking team limited to the 50-yard line. During the kick, the receiving team can set up blockers who can use unlocked hands and arms to block the kicking team. Any member of the receiving team can receive the kick and try to advance the ball. The receiving player, however, can use a fair-catch signal by waving his arm over his head before catching and securing the ball. A fair-catch marks the player down at the location of the catch. The game clock starts when the ball has been touched or caught by the receiving team. However, the clock doesn't start if the ball goes out of bounds or is fair-caught by the receiving team. If the ball goes out of bounds before being touched by the receiving team, it is considered an illegal kick and the receiving team assumes possession at the location where it went out of bounds or 25 yards from the point of the kick, whichever is most advantageous to the receiving team.